The South Atlantic League is one of two Class A circuits where Minor Leaguers can get their first tastes of full-season ball. On Tuesday, that taste got a whole lot sweeter for some Sally League players. MVP Casey Golden (Asheville), Most Outstanding Pitcher Denyi Reyes (Greenville) and Most Outstanding MLB Prospect Oneil Cruz (West Virginia) were among those honored as the South Atlantic League named its end-of-season All-Stars. Golden earned the top award in the circuit one year after he was taken in the 20th round of the 2017 Draft by the Rockies. The UNC Wilimington product leads the Sally League with 32 home runs, 57 extra-base hits, 90 RBIs, 86 runs scored and a .579 slugging percentage while his .919 OPS and 158 wRC+ each rank second among qualifiers. Also with 23 steals on his resume, Golden was the league's only member of the 20-20 club. Similarly, Reyes made for a relatively easy pick as the SAL's top pitcher. The No. 30 Red Sox prospect, who was promoted to Class A Advanced Salem on Aug. 4, leads league qualifiers with a 1.89 ERA and 0.85 WHIP over 123 2/3 innings. Including his time in the Carolina League, his 0.87 WHIP is tops among all full-season qualifiers this season, thanks to his stellar control. The 21-year-old right-hander walked only 13 batters over his 123 2/3 frames with Greenville, striking out 122 over the same span. His ratio of 8.8 K/BB is second-best among Minor League hurlers with at least 100 innings pitched. Cruz takes the top prospect award after hitting .286/.343/.488 with 14 homers, seven triples, 25 doubles and 11 stolen bases in 103 games with West Virginia. The 6-foot-6 shortstop is ranked as the Pirates' No. 4 prospect by MLB.com and No. 10 among players at his position, a credit to his athletic ability despite being seen as being oversized for a shortstop. He won Most Outstanding MLB Prospect over No. 96 overall prospect Drew Waters, the only member of MLB.com's top 100 to crack the end-of-season All-Star list. Waters hit .303/.353/.513 with nine homers and 20 steals in 84 games for Rome before getting his own promotion to Class A Advanced Florida on Aug. 1. 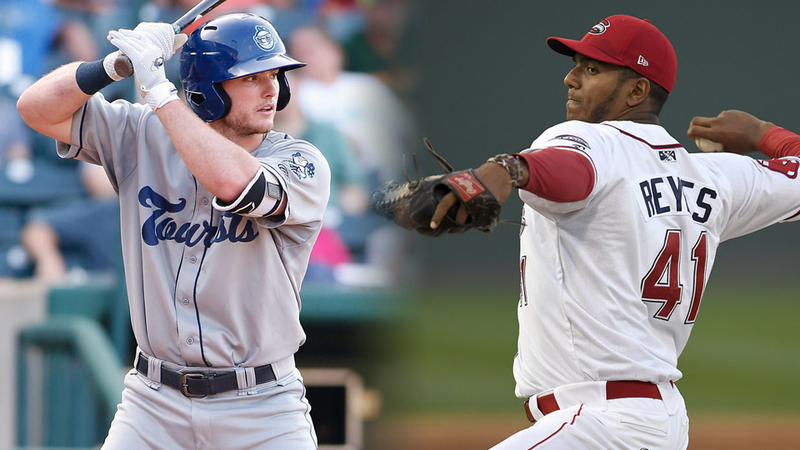 First baseman Chad Spanberger (22 homers, .942 OPS) and third baseman Jean Carlos Encarnacion (.283/.306/.455) each made the All-Star cut at their respective positions even after being dealt in deadline trades. Spanberger went from the Rockies system to the Blue Jays as part of the Seunghwan Oh deal while Encarnacion was moved from the Braves to the Orioles in the package that sent Kevin Gausman the other way. Lexington's Seuly Matias received one of the three outfield spots after leading the Minors in home runs for much of the season. The Royals' No. 3 prospect hit 31 long balls in 94 games this season but has been on the disabled list since Aug. 15 with a thumb injury.